Kristine shares a story about getting caught with an unlicensed image on her blog. She was sent a letter from a lawyer and had to pay a fee. The image was from a post published in 2011, she had just launched her blog that year. Ignorance is not an excuse to break the law, however. So she paid the fine and added this to her important list of lessons learned. This episode is about all those times we made a mistake and learned a valuable lesson. 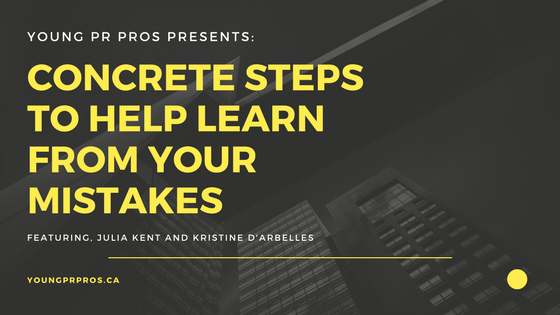 But Young PR Pros goes beyond just being aware of your mistakes and dives into the learning. If you make a big mistake that gets you fired, humiliated, etc., you are never going to make that mistake again, because it stays with you. But what about those smaller mistakes, forgetting a grammar law in your writing, forgetting to include someone in your email, or miscommunication an idea. Make notes while you are working. If you are half way through something and its hard and you regret the path, jot it down. Refer to those notes at the beginning of a new project. Post-project or debrief meetings are super important. If your employer doesn’t host them, be the person to suggest it. Use this as a learning opportunity to see what your colleagues see as a success and what they see as failure. Admit your mistake. You can only learn from a mistake after you admit you’ve made it. As soon as you start blaming other people (or the universe itself), you distance yourself from any possible lesson. Listen to the full episode for more concrete tips. This entry was posted in Young PR Pros podcast and tagged career, career advice, career choices, clare bonnyman, job, jobs, julia kent, kristine d'arbelles, professionals, ross simmonds, young pr pros, youngprpros by Kristine D'Arbelles. Bookmark the permalink.